Citation: C N Trueman "Women in World War Two"
As in World War One, women played a vital part in this country’s success in World War Two. But, as withWorld War One, women at the end of World War Two, found that the advances they had made were greatly reduced when the soldiers returned from fighting abroad. At the end of World War Two, those women who had found alternate employment from the normal for women, lost their jobs. The returning soldiers had to be found jobs and many wanted society to return to normal. Therefore by 1939, many young girls found employment in domestic service – 2 million of them, just as had happened in 1914. Wages were still only 25p a week. When women found employment in the Civil Service, in teaching and in medicine they had to leave when they got married. However, between the wars, they had got full voting equality with men when in 1928 a law was passed which stated that any person over the age of 21 could vote – male and female. The war once again gave women the opportunity to show what they could do. Young mothers with young children were evacuated from the cities considered to be in danger. In all, 3.5 million children were evacuated though many went with a teacher. As young children were normally taught by females, many of those who went with the children were women. The fact that women were seen to be the people who taught the youngest was something that had been going on for years. As in World War One, women were called on to help on the land and the Women’s Land Army (WLA) was re-formed in July 1939. Their work was vital as so many men were being called up into the military. In August 1940, only 7,000 women had joined but with the crisis caused by Hitler’s U-boats, a huge drive went on from this date on to get more women working on the land. Even Churchill feared that the chaos caused by the U-boats to our supplies from America would starve out Britain. The government tried to make out that the work of the WLA was glamorous and adverts showed it as this. In fact, the work was hard and young women usually worked in isolated communities. Many lived in years old farm workers cottages without running water, electricity or gas. Winter, in particular, could be hard especially as the women had to break up the soil by hand ready for sowing. However, many of the women ate well as there was a plentiful supply of wild animals in the countryside – rabbit, hares, pheasant and partridges. They were paid 32 shillings a week – about £1.60. In 1943, the shortage of women in the factories and on land lead to the government stopping women joining the armed forces. They were given a choice of either working on the land or in factories. Those who worked on land did a very valuable job for the British people. Many women decided that they would work in a factory. They worked in all manner of production ranging from making ammunition to uniforms to aeroplanes. The hours they worked were long and some women had to move to where the factories were. Those who moved away were paid more. Skilled women could earn £2.15 a week. To them this must have seemed a lot. But men doing the same work were paid more. In fact, it was not unknown for unskilled men to get more money that skilled female workers. This clearly was not acceptable and in 1943, women at the Rolls Royce factory in Glasgow went on strike. This was seen as being highly unpatriotic in time of war and when the female strikers went on a street demonstration in Glasgow, they were pelted with eggs and tomatoes (presumably rotten and inedible as rationing was still in) but the protesters soon stopped when they found out how little the women were being paid .The women had a part-victory as they returned to work on the pay of a male semi-skilled worker – not the level of a male skilled worker but better than before the strike. During the Blitz on London women in voluntary organisations did a very important job. The Women’s Voluntary Service provided fire fighters with tea and refreshments when the clear-up took place after a bombing raid. The WVS had one million members by 1943. Most were quite elderly as the younger women were in the factories or working on farms and were too exhausted to do extra work once they had finished their shift. The WVS also provided tea and refreshments for those who sheltered in the Underground in London. Basically, the WVS did whatever was needed. In Portsmouth, they collected enough scrap metal to fill four railway carriages……..in just one month. They also looked after people who had lost their homes from Germans bombing – the support they provided for these shocked people who had lost everything was incalculable. When the WVS were not on call, they knitted socks, balaclavas etc. for service men. Some WVS groups adopted a sailor to provide him with warm knitted clothing. In the military, all three services were open for women to join – the army, air force and navy. Women were also appointed as air raid wardens. 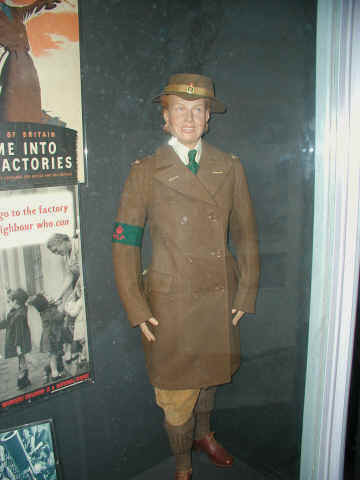 In the army, women joined the Auxiliary Territorial Service (ATS). Like soldiers, they wore a khaki uniform. The recruiting posters were glamorous – some were considered too glamorous by Winston Churchill – and many young ladies joined the ATS because they believed they would lead a life of glamour. They were to be disappointed. Members of the ATS did not get the glamour jobs – they acted as drivers, worked in mess halls where many had to peel potatoes, acted a cleaners and they worked on anti-aircraft guns. But an order by Winston Churchill forbade ATS ladies from actually firing an AA gun as he felt that they would not be able to cope with the knowledge that they might have shot down and killed young German men. His attitude was odd as ATS ladies were allowed to track a plane, fuse the shells and be there when the firing cord was pulled……By July 1942, the ATS had 217,000 women in it. As the war dragged on, women in the ATS were allowed to do more exciting jobs such as become welders (unheard of in ‘civvie’ street), carpenters, electricians etc. Women who joined the Royal Air Force were in the Women’s Auxiliary Air Force (WAAF). They did the same as the ATS (cooking, clerical work etc) but the opportunities were there for slightly more exciting work. Some got to work on Spitfires. Others were used in the new radar stations used to track incoming enemy bomber formations. These radar sites were usually the first target for Stuka dive-bombers so a post in one of these radar stations could be very dangerous. However, the women in this units were to be the early warning ears and eyes of the RAF during the Battle of Britain. For all of this, women were not allowed to train to be pilots of war planes. Some were members of the Air Transport Auxiliary (ATA) which flew RAF planes from a factory to a fighter squadron’s base. There were 120 women in this unit out of 820 pilots in total. The women had fewer crashes than male pilots but they were not welcome as the editor of the magazine “Aeroplane” made clear : they (women ATA) “do not have the intelligence to scrub the floor of a hospital properly.” He , C.G. Grey, claimed that they were a “menace” when flying. Women were also used as secret agents. They were members of SOE (Special Operations Executive) and were usually parachuted into occupied France or landed in special Lysander planes. Their work was exceptionally dangerous as just one slip could lead to capture, torture and death. Their work was to find out all that they could to support the Allies for the planned landings in Normandy in June 1944. The most famous female SOE members were Violette Szabo and Odette Churchill. Both were awarded the George Cross for the work they did – the George Cross is the highest bravery award that a civilian can get. Both were captured and tortured. Violette Szabo was murdered by the Gestapo while Odette Churchill survived the war. Women were also extremely important in entertainment. The two most famous female entertainers during the war were Vera Lynn (now Dame Vera Lynn) and Gracie Fields. Vera Lynn’s singing (“There’ll be blue birds over the White Cliffs of Dover” and “We’ll meet again, don’t know where, don’t know when”) brought great happiness to many in Britain. She was known as the “Forces Sweetheart”. Gracie Fields was another favourite with the forces. The war in Europe ended in May 1945. At this time there were 460,000 women in the military and over 6.5 million in civilian war work. Without their contribution, our war effort would have been severely weakened and it is probable that we would not have been able to fight to our greatest might without the input from women. Ironically, in Nazi Germany, Hitler had forbidden German women to work in German weapons factories as he felt that a woman’s place was at home. His most senior industry advisor, Albert Speer, pleaded with Hitler to let him use German female workers but right up to the end, Hitler refused. Hitler was happy for captured foreign women to work as slaves in his war factories but not German. Many of these slave workers, male and female, deliberately sabotaged the work that they did – so in their own way they helped the war effort of the Allies.